I ran into a new issue that isn’t well documented publicly earlier this week. I installed two new Exchange 2013 CU8 servers as “Hybrid” servers for an Office 365 integration deployment. After configuring the servers, I noticed that none of the web based services on one of the servers was functioning properly and the following Application Event Log entry was reported for all web services (EWS, ActiveSync, MAPI, RPC, OWA, etc…). Could not load file or assembly ‘Microsoft.Exchange.Security, Version=15.0.0.0, Culture=neutral, PublicKeyToken=31bf3856ad364e35’ or one of its dependencies. The system cannot find the file specified. Based upon this event as well as the error shown in the browser when attempting to use one of these services. After checking the web.config files on each web service directory and not finding any issue, we opened a PSS case and found an undocumented issue with installation of the server. 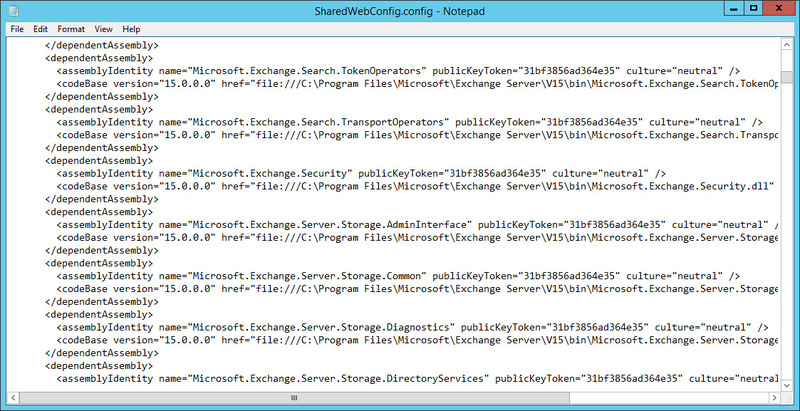 For an unknown reason, the SharedWebConfig.Config file was missing on the server altogether. It should be located at C:\Program Files\Microsoft\Exchange Server\V15\ClientAccess, but in this case the file was not there. This file contains a listing of all DDL Assembly locations including the Microsoft.Exchange.Security DLL that was in the error. 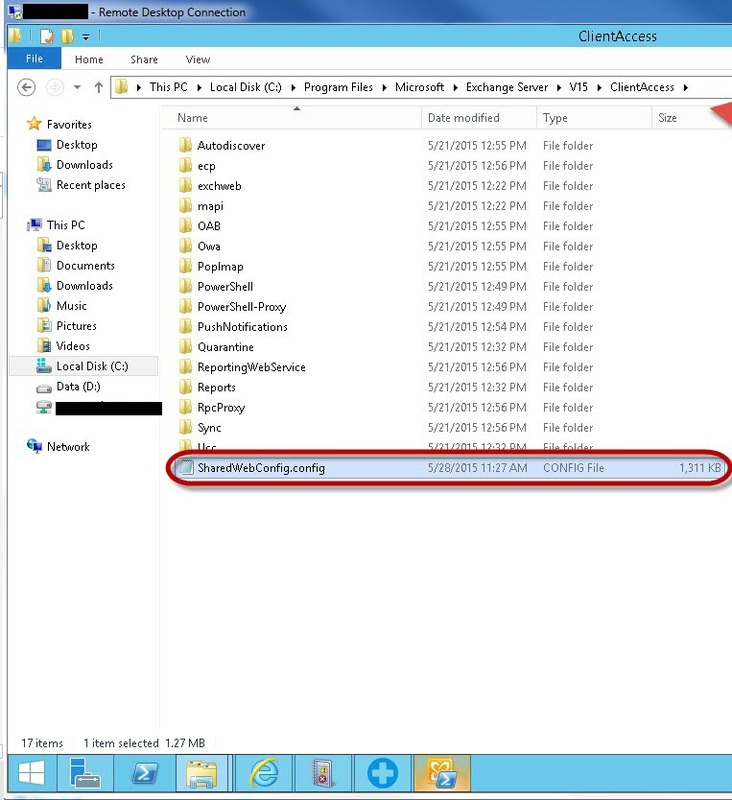 The solution was to simply copy this config file from a working server with the same install path and restart IIS. Hopefully, this will assist anyone else facing this issue. I ran through the same issue with a different assembly and this post pointed me onto the right direction. Hey Gary…I’ve been working on issue that came up after building a new Exchange CAS/MBX to replace an older on-prem server. I used latest build, Exchange 2013 CU9. After clean install the event viewer continued to receive 1310 events every couple of mins. FInding this was the exact fix I needed. Thanks a ton for documenting your issue and fix found through MS PSS, and I am not sure how MS will leave the same bug from CU8 when releasing CU9. Thanks again! Thanks for the post… this happened to me on Exchange 2016 when you do not install Exchange to the default directory. Copy “%ExchangeInstallDir%\FrontEnd\HttpProxy\SharedWebConfig.config” to “%ExchangeInstallDir%\ClientAcess” and OWA and ECP worked like a charm. That’s what worked for me, thank you for your post, its what lead me to that somehow. Appreciate your time! Thanks for this post, It did the trick on a new 2016 install. Same to me with 2013 cu 14.